Toast bread in an ungreased grill pan, approx. 2 – 3 min. per side. Juice lime. Remove pit from avocado. Slice avocado and layer slices on top of the toast. Season with lime juice, salt, and pepper. In a medium saucepan, bring salted water to a boil. Then reduce heat and add white vinegar. Crack eggs into separate cups. Stir water continuously with a cooking spoon to form a whirlpool. Then carefully pour eggs, one by one, into water. 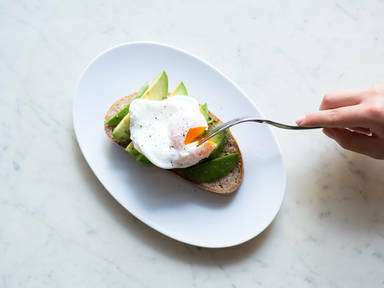 Cook eggs for 3 – 4 min, then use a slotted spoon to gently remove from water. Set on top of toast and season with salt and pepper to taste. Enjoy!